In today's Nov. 15, 2011 newsletter . . .
Was Steve Reeves a Hot House Plant? There may be debate over the value (and in some cases even the safety) of taking dietary supplements, but no one disputes the worthiness of eating fresh, healthful, real food. 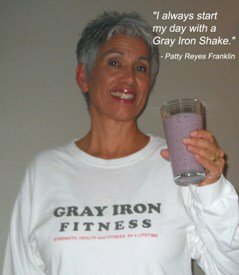 Try this delicious smoothie for breakfast or at mid-morning for a bounty of vitamins, minerals, anti-oxidants, protein, and complex carbs. 3-tablespoons of freshly ground* flaxseeds. 2-scoops of unflavored whey protein powder (40 grams of protein). 2-½ cups of unflavored soy milk (with no added sweeteners). Wow! It’s delicious and loaded with terrific healthful ingredients to really get your motor running. Watch out for an almost uncontrollable urge to do push-ups! Bonus: Surprisingly, you can also add vegetables such as spinach or kale leaves for added nutrients without changing the wonderful berry flavor. Begin with small amounts and gradually add more to find the perfect proportions to suit your taste. At dinner, try this delicious vitamin/mineral/anti-oxidant blast. 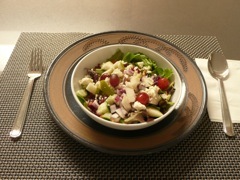 It is so good you may decide to include it at every evening meal. That's the way it is at our house. For each diner, include a . . . Handful of lettuce and spinach leaves (remove any stems), a 50/50 mix. Wash the greens thoroughly and spin dry. Slice and dice some cucumber. Slice and dice some red onion. Chop-up and add a little red cabbage. Add some chopped fresh apple, or nectarine, or a pear. Scatter a few red grapes. Add a small handful of chopped raw walnuts. Scatter a few dried cranberries. Scatter a teaspoon of crumbled feta cheese. Dress with extra virgin olive oil & white wine vinegar (add a little salt & pepper, according to taste). Notice the variety of colors when you make the salad. Why is that important? By mixing the fruit and vegetable colors, you automatically cover daily vitamin/mineral requirements. 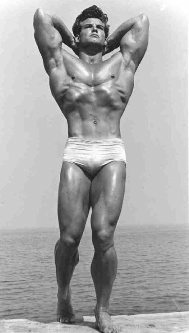 The Steve Reeves page in my "Muscle Stories" section gets more visitors than any other personal story. They arrive after doing Internet searches for the Reeves diet, or his workouts, or where he worked out . . . interest in the late Steve Reeves seems endless. Many people ask if he was truly strong, or did he just look strong? With certain exceptions -- Grimek, Hilligenn, and Tommy Kono, come to mind -- most Mr. America or Mr. Universe types, though certainly stronger than the average person, do not come close to being as strong as those who train primarily as lifters. Reeves' goal was to build his body as close as possible to the classic physique, like the idealized sculpture of a Greek god. He even had a mathematical formula, "The Standards of Symmetry," that listed ideal proportions, according to a person's height. He certainly achieved those ideal proportions, and many believe he was the most symmetrical bodybuilder of all time. But to answer the original question: was he strong, or did he just look strong? Well, he was not as strong as, say, Grimek, John Davis, or Doug Hepburn (famous champion lifters of that period). But, yes, Steve Reeves was strong. 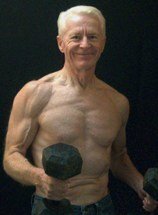 Strength & Health's editor, John Grimek, told a few stories about Reeves' ability that were witnessed at the famous York Gym. Read more about that at the Steve Reeves page.